Another of the 'Short' Cuban cigars released over the last few years by many of the brands. These cigars are much sought after by those who wish to smoke complex cigars, but don't have hours to do so. 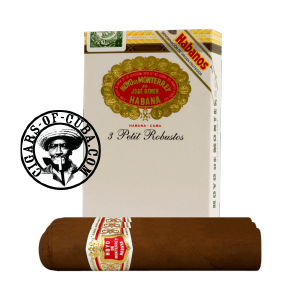 The Hoyo Petit Robustos is one of the best examples of this type of smoke. When you first light, it feels like you've entered the cigar directly in the final phase of a big cigar. Intense and very quickly powerful, woody, nutty tones do make an in-and-out appearance between the full bodied smoke. The finish is very strong and rich. At last a Petit Robusto to satisfy the demand of a generation of cigar aficionados seeking a full bodied short smoke. Mild and earthy beginning. Evolving progressively without being overpowering. A very pleasant cigar. Reminds us with the glory days of Cuba (pre-Castro small cigars like Rey Del Mundo Royal Serie No.3). The finish is outstanding. We couldn't stop smoking the last part even when we started to burn our fingers. This is a great short smoke.My cigar buddy buy a box together and love this cigar.Great from the start and wonderful strong finish.Don't let the size fool you ..